The shortest distance between two points is a straight line. And you don’t care. Because the best places to visit rarely fall on that path. Road trips can be awesome. You stare at a map and dream; and while you may need, or desire, to get to a specific destination, the route you take can be as circuitous as time and money allow. The western United States contain a plethora of exciting locations: National Parks, Monuments, cultural sites, historic sites, forests, wilderness areas, mountains, rivers, deserts, beaches – and that’s just the Federal lands; throw in state and local areas and there’s a lot to choose from! Plus, if you’re blessed with family and friends, the opportunities can be almost overwhelming. The past couple weeks have been awesome. Sharing with family and friends, attending a rally, hiking new trails, playing the tourist, listening to great music, viewing beautiful art, deepening my knowledge of native cultures, meeting new people. And this trip isn’t close to being over. Yet with all I’ve done in a relatively short time, there is a nagging frustration; a feeling that I’ve just scratched the surface of the opportunities available to me. In almost every place I’ve been, I’ve wanted to stay longer and explore more before moving on. There is a temptation to constantly hurry, to tick off items on a list since I don’t know when I might be back this way again. Perhaps instead of trying to do everything, the best thing might be to do less and savior that which I do more. Which would make perfect sense if I didn’t keep hearing the voice of Robert Service in my head. 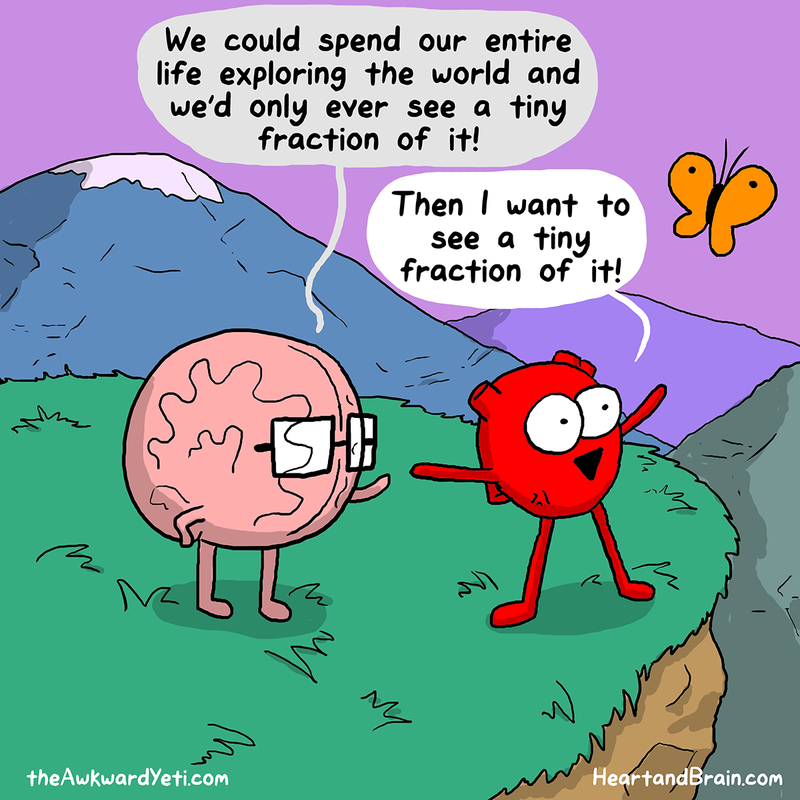 Cartoonist Nick Seluk of ‘The Awkward Yeti‘ and ‘Heart and Brain‘ has an insightful cartoon dealing with this dilemna. There will always be more to do and see than one can do, and that’s a good thing. It means boredom is a state of mind, a result of our own narrow focus and limitations. As a person matures as a traveler or an explorer there is a realization that visiting someplace once may not be enough. My wife and I try to attend the opera in Santa Fe each year. People ask why not go someplace else instead? My response is: “have you ever been to Santa Fe?” There is always new music, new art and exhibits, new restaurants, hikes we haven’t done, and that doesn’t include seeing something for a second or third time and discovering something we hadn’t noticed before. We never tire of the place and always want to stay longer. Back to my road trip. I try to assuage some of the frustrations I’m feeling by ‘wanting to see it all’ by telling myself this is just a ‘sampler’ trip. I can take the knowledge gained on this adventure and plan more focused trips for the future. Sure I’m rationalizing, but it helps me cope. For while my heart wants to see it all, my brain also reminds me of another poem by Robert Service: “The Land of Beyond”. Nicely written, thanks for sharing. I yearn to explore the world close to me, with barely an interest in anything requiring a car or plane to get to. This has enabled me to really see Oregon, every little part of it!